Former New York City Mayor Rudy Giuliani has some advice for Chicago Mayor Rahm Emanuel when it comes to combating the city’s rising violence rates. “He needs to do what I did,” he said. 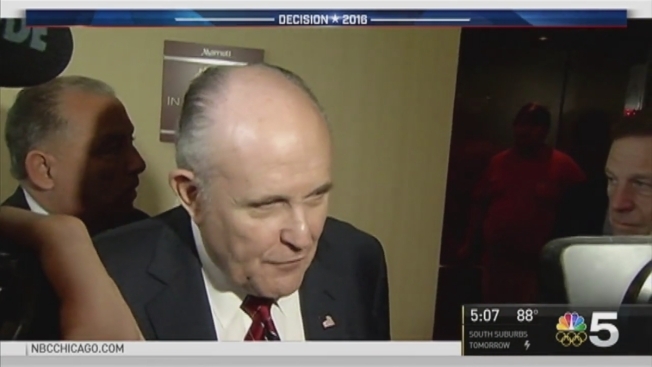 Giuliani talked about Chicago’s crime at the Republican National Convention Thursday, telling Arkansas Republicans that gun control does not control crime. “They are shooting people in Chicago like it is a shooting gallery,” he said, citing the more than 60 people shot over Memorial Day weekend in the city. From one mayor to another, Giuliani didn’t hold back on what he believes needs to be done to battle the headline-making violence. “Look what is going on Chicago and our inner cities. Not good!” the tweet read. Chicago has seen a spike in violence in 2016. So far this year, there have been 2.223 shootings, nearly 3,000 shooting victims and 358 homicides, according to the Chicago Tribune. Earlier this week, a 6-year-old girl became one of more than 20 children under the age of 13 to be shot in the city so far this year. The child was shot in broad daylight while playing with family members outside her home on a warm summer day. "The level of gun violence on the south and west sides of our city is absolutely unacceptable, and it’s appalling when our children are caught in the crossfire of individuals who have no regard for human life," Chicago Police Supt. Eddie Johnson said in a statement. "To safeguard our neighborhoods and our children, it is imperative that we establish a culture of accountability for repeat gun offenders in Chicago and hold them responsible for senseless gun crime."